Urban demographic patterns in the United States often defy logic, but a new research paper co-authored by Harvard Kennedy School Professor Edward Glaeser is shedding light on why many Americans continue to move to cities that are on the downturn. "Unhappy Cities," published by the National Bureau for Economic Research (NBER), unpacks the myriad factors that play a role in inducing people to relocate to metropolitan areas that they would otherwise not find suitable. "Self-reported unhappiness is high in [many] declining cities, and this tendency persists even when we control for income, race, and other personal characteristics," the authors write. "Why are the residents of some cities persistently less happy? Given that they are, why do people choose to live in unhappy places?" The authors use data culled from the General Social Survey (GSS), the National Survey of Families and Households (NSFH), and the Centers for Disease Control and Prevention (CDC) to track citizens who move to areas where there are high levels of unhappiness. They also examine the ways in which urban unhappiness can be offset by the benefits that may derive from higher incomes and other amenities. The study also utilized life satisfaction survey data from the Behavioral Risk Factor Surveillance System (BRFSS), which, when controlling for demographics, rank the top four "happiest" American cities as Charlottesville, Va.; Rochester, Minn.; Lafayette, La. ; and Naples, Fla. 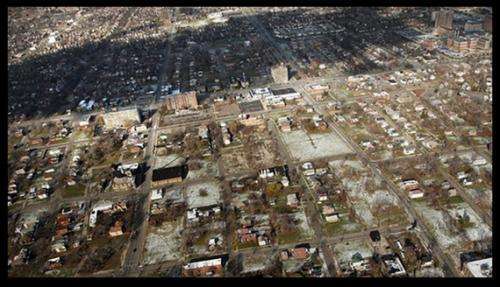 Examples of cities that are in decline and unhappy are Eire, Pa.; Scranton Pa.; and Detroit. According to the second view in the study, Detroit was unhappy even during its heyday, but historically, its residents were well-compensated for their joylessness. Glaeser and his fellow researchers report finding significant differences in well-being across American cities, and at least three examples in which unhappiness is correlated with urban decline. That said, they do not conclude that population decline itself is responsible for the unhappiness. "Differences in happiness and subjective well-being across space weakly support the view that the desires for happiness and life satisfaction do not uniquely drive human ambitions," the authors write. "If we choose only that which maximized our happiness, then individuals would presumably move to happier places until the point where rising rents and congestion eliminated the joys of that locale. An alternative view is that humans are quite understandably willing to sacrifice both happiness and life satisfaction if the price is right. … Indeed, the residents of unhappier metropolitan areas today do receive higher real wages—presumably as compensation for their misery." The authors also conclude that many cities with high degrees of unhappiness today were similarly situated in the past, leading the authors to deduce that citizens in previous generations may also have enjoyed higher wages and lower rents as trade-offs for remaining in unhappy cities.